With his Titan Master partner Teslor, Brainstorm attempts to sequence the cityspeaking ability of Windblade and reproduce it, so other Autobots can harness the power of the towering Titans. Robot Mode: At this point in time I really need to congratulate Titans Return for cranking out one good figure after another and despite the fact that molds are being reused, naturally, the resulting figures manage to look quite different. Case in point Brainstorm, who is a remold of Blurr, but you certainly wouldn’t notice it in robot mode unless you looked very, very closely. A different head, the wings on the shoulders, different colors and some other changes fully suffice to make this a unique figure, no matter that much of its design was used before. Brainstorm is fully articulated, no problems, even including twisting wrists. He comes with two different weapons. One is a small rifle, the other a really big arm shield / gun combination that doubles as the nose of his jet mode. He can attach it to his arm, hold it in hand, or store it on his back. I especially like his head mold, which looks great, and the rest of the body isn’t lacking in details, either. Very nicely done. This version of Brainstorm is an exclusive from the San Diego Comic Con and differs from the retail version in color only. 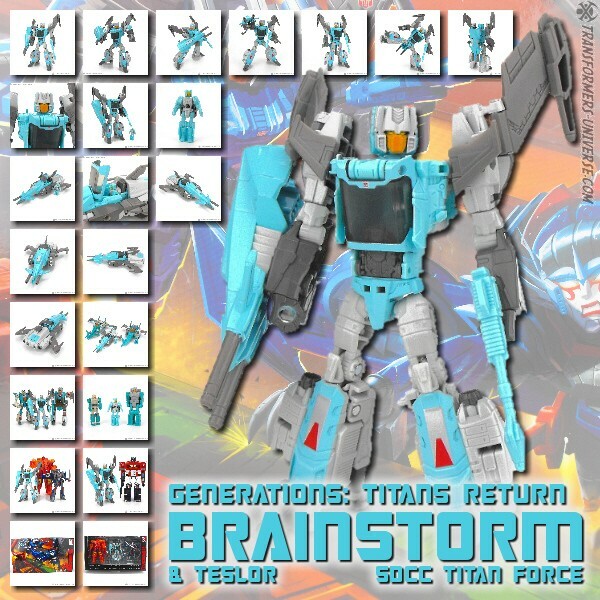 Titan Force Brainstorm has a brighter, almost pastel-like turquoise compared to the more greenish hue of the retail version, but that’s the only difference. So bottom line, an excellent robot mode, no matter which version you prefer. Alternate Mode: Being an extensive remold of Blurr, Brainstorm’s vehicle mode has a strong similarity to the futuristic hover car Blurr becomes. It just adds wings on the sides, Brainstorm’s characteristic double guns on the front, and suddenly you have a rather different looking vehicle that is clearly a space jet. Nicely done. The cockpit opens to seat Teslor (see below), the smaller gun goes underneath the nose of the jet, and a landing gear is present, too (though not retractable). So while Brainstorm’s jet mode has probably the smallest wing span of all the various Brainstorm figures I’ve yet seen, it’s still quite clearly a space jet and works great. Thumbs up for the vehicle mode. Parter / Add-On: Like all Titans Return figures Deluxe class and above, Brainstorm is a Headmaster whose head detaches and becomes a separate figure. His is called Teslor and he is an average Titan Master figure with ball-jointed shoulders and joint knees. Teslor can sit in Brainstorm’s cockpit in jet mode and use his big gun as a kind of gun boat / gunnery emplacement that can attach to Leader-class Titans Return figures in base mode. Nothing special, but good enough for what he is. Remarks: For the longest time Brainstorm was simply one of the four 1987 Headmasters. He had minor roles in a few comic books and featured in the cartoon (briefly), but that was pretty much it. That is until he was fleshed out in the IDW More Than Meets the Eye comic series, where he was portrayed as a weapon designer of questionable morals and sanity. He was also later revealed as a Decepticon double agent and built a time machine to try and go back in time and prevent the creation of Megatron, which resulted in the creation of an alternate universe. Ever since, people have loved Brainstorm and we have gotten more than a few official and unofficial figures of him. Already owning the Fansproject Smart Robin version of Brainstorm, I didn’t originally intend to get another one, but having won the Titan Force box set in a contest, I am more than happy having this one (not keeping Sentinel Prime and Windblade, though). It’s another very nice Titans Return Deluxe figure, further emphasizing how good this line has been so far. Now whether you prefer the paintjob of this exclusive figure here to that of the retail version is, of course, entirely subjective, but colors aside, you really should give this figure here a look. It’s well worth it.